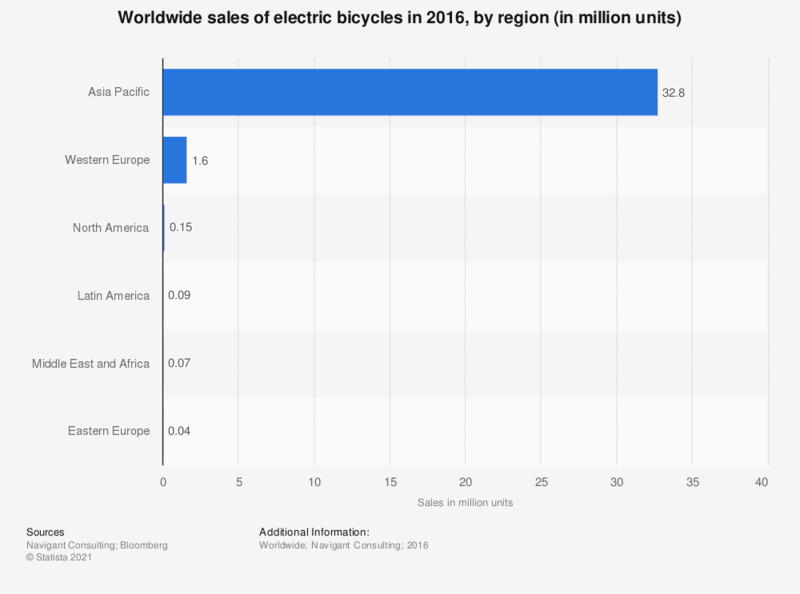 This statistic represents electric bicycle sales worldwide in 2016, by region. In 2016, some 32.8 million electric bikes were sold in the Asia-Pacific region. This particular region is expected to remain the most important market for electric bikes worldwide. Electric bicycles, also known as e-bikes or power-assisted bikes, have seen a constant growth in sales. China has been the largest market for electric bicycles since 2000. Here, sales have skyrocketed from about 300,000 in 2000 to almost 33 million units in 2016. E-bikes are used among the populace as an alternative to scooters and mopeds. Despite the amount of accidents caused by using e-bikes in the cities, sales continue to grow. China is also the largest manufacturer and exporter worldwide. Although China continues to lead the world in production and sales of electric bicycles, Europe has begun to emerge as a relevant market during recent years, as over one million units were sold in 2012. In Germany, for example, e-bikes are used by postal employees. As of August 2014, DHL Deutsche Post had over 6,000 power-assisted bikes in service. Prices for electric bicycles usually reach the high 2,000 U.S. dollar range. The electric motor can be aided by pedaling (e-bikes that use pedals are called pedelecs) or is activated by a throttle. Pedelecs can reach speeds usually up to 25 km/h. More powerful pedelecs – called S-Pedelecs – can reach higher speeds, and are usually classified as mopeds or light bicycles.